"But the cowardly, unbelieving, abominable, murderers, sexually immoral, sorcerers, idolaters, and all liars shall have their part in the lake which burns with fire and brimstone, which is the second death." 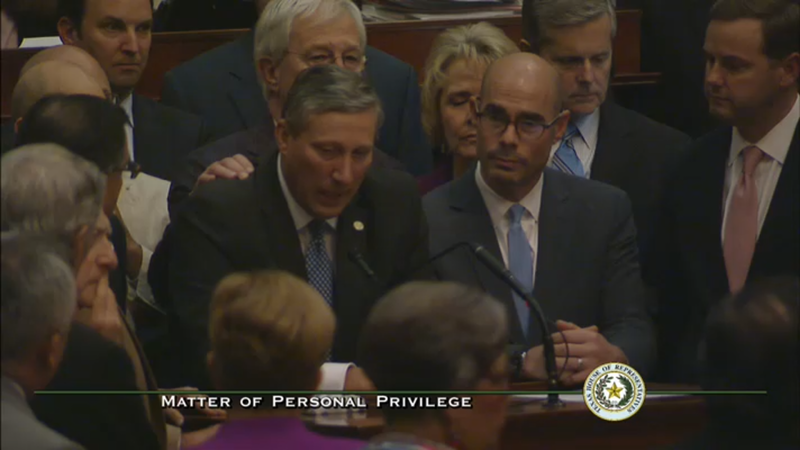 Having had a night to sleep over last night's delightful chaos on the House floor, one thought stands out: the selfish hypocrisy of Drew Springer's 'personal privilege' speech. To summarize: Yesterday was the deadline to pass bills out of the Texas House. During the day, House leadership used parliamentary trickery to sabotage the Freedom caucus. With nothing to lose, the Freedom caucus acted within the rules to derail the collection of awful bills leadership instead chose to pursue. This was accomplished through a tactic called "chubbing," which is a fancy term for stalling in the face of a hard deadline. An hour before the midnight deadline, Drew Springer rose to give a theatrical speech about a bill in which he has a legitimate personal interest. HB 810 is a relatively innocuous bill that would provide regulatory clarity for some new medical treatments. Apparently, as he made abundantly clear last night, Springer believes these treatments could potentially help his wife. That's fine, as far as it goes. As stated above, HB 810 is a relatively innocuous bill on the merits, and we would have no problem with it in a vacuum. But we don't live in a vacuum, and Drew Springer's actions this week encapsulates the sense of entitlement with which far too many politicians view the world. Let's backtrack and ask a separate question: What was Drew Springer doing less than 24 hours before his hysterical floor speech?!? In other words, it's o.k. in Drew Springer's leave regular Texans vulnerable to the predations of government...but we're expected to fall in line for a bill he thinks might help his wife?!? Actions like the one Drew Springer took last night explain why Donald Trump is President. Caption: Relating to designating October 19 as Breast Reconstruction Awareness Day. Caption: Relating to designating March 21 as BRAVE Day. Caption: Relating to the designation of a portion of U.S. Highway 380 in Young and Jack Counties as the Henry H. King Memorial Highway. Caption: Relating to the designation of a portion of Farm-to-Market Road 1810 in Jack County as the Luther G. Prunty Memorial Highway. HB 555 Author: Springer | et al. Caption: Relating to an additional fee for issuing a marriage license to applicants who are not residents of this state. Caption: Relating to the authority of a retail public water utility to require an operator of a correctional facility to comply with water conservation measures. HB 1643 Author: Springer | et al. Caption: Relating to the regulation of the operation of an unmanned aircraft and the prosecution of a related criminal offense. Caption: Relating to transferring charge and control of a painting entitled "The Spirit of the Alamo Lives On." And, even though it hasn't gone anywhere, who can forget Springer's infamous tampon bill?!? We wish nothing but the best for Mrs. Springer, but if her ability to walk genuinely hinges on the passage of an obscure bill this legislative session, we suggest she discuss the subject of priorities with her husband. HB 1300: Relating to the collection and use of municipal hotel occupancy taxes. Do you know why that bill was postponed at 6:47 pm?!? The bill was postponed because Springer was attempting to push a tax increase for short term rentals [Note: Amendment #4]; while Springer ultimately withdrew the amendment, it's still notable that that's what he was pushing at 6:47 pm. But, at 11 pm, his wife's ability to walk hinged on the passage of an obscure bill. It almost goes without saying, but let's say it anyway: If Drew Springer's wife's ability to walk hinged on the passage of an obscure bill this legislative session, why didn't he pass it in March or April?!? Bottom Line: No one opposes regulatory clarity for obscure medical treatments that might help Drew Springer's wife, but it would be nice if he would show similar courtesy to the rest of us. #TXLEGE: Senate passes Campus Free Speech bill!!! Can we stop hyping the Castro twins?! ?